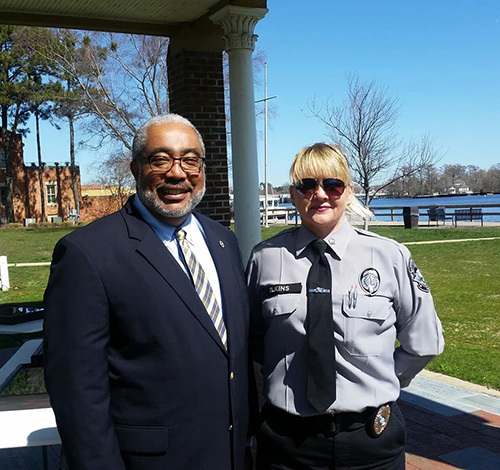 Carla Elkins and Eric Brainard prepared and presented a presentation in downtown Elizabeth City on Friday, March 23, 2018 at the waterfront gazebo to honor the fallen officers of Pasquotank Correctional Institution. 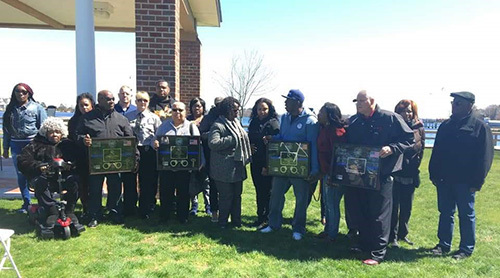 The families of the murdered Pasquotank Correctional employees’ families were honored with memorial shadow boxes. 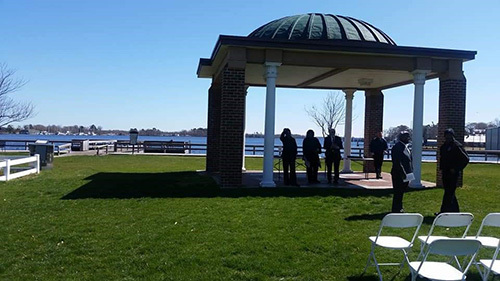 It was a small outdoor program to honor and show support for the Pasquotank Correctional employees who lost their lives from the incident on October 12, 2017. 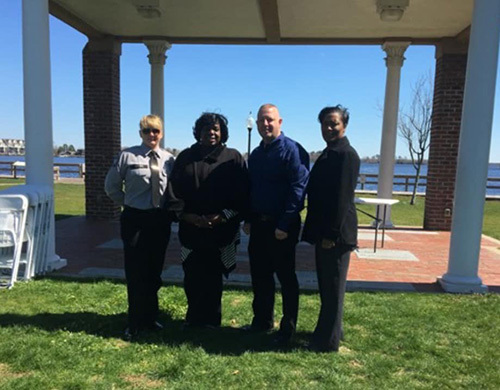 To honor the deaths of Correctional Officer Justin Smith, Officer Wendy Shannon, Correction Enterprises Manager Officer Veronica Darden, and Correctional Maintenance Mechanic Geoffrey Howe, Corrections Chapter Board member Carla Elkins presented shadow boxes to the families’ members that Eric Brainard (a correctional officer from New Jersey) had made. The PBA supported this and worked with Carla to absorb the costs. 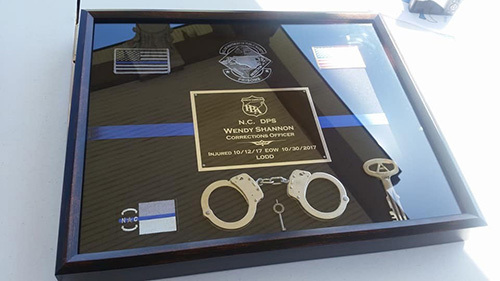 Wendy Shannon was an NCPBA member whose beneficiary received the accidental death benefit from SSPBA and her family received further assistance from the Police Benevolent Foundation. 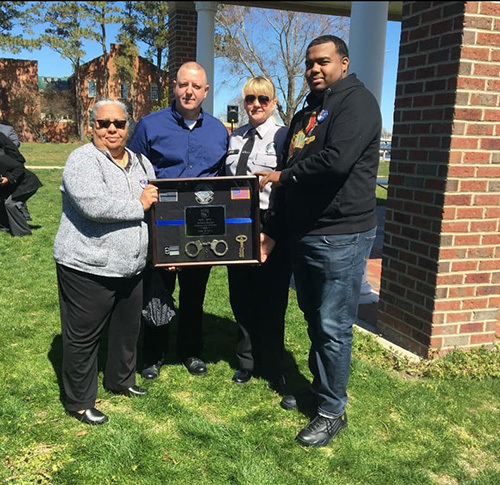 Family members attended to receive shadowboxes in honor of Correctional Officers Justin Smith and Wendy Shannon, Correction Unit Manager Veronica Darden. 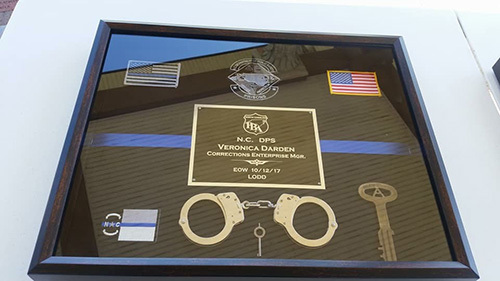 The shadowbox for Geffrey Howe, a mechanic with in Institution, was received by David Hill, the Correctional Unit Manager, on behalf of Howe’s family. On October 12, 2017, inmates attempted to escape the Pasquotank Correctional Institution in Elizabeth City. Four prison employees were killed. 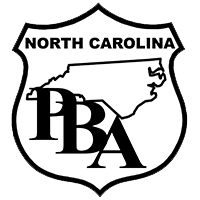 This escape has been described as one of the deadliest escape attempts in North Carolina History. The escape came from the facility’s sewing plant, where one correctional officer was left to guard over 30 inmates. The inmates attacked the officers with scissors and hammers as they attempted to flee. One inmate made a face call over the radio, claiming an inmate disturbance on the opposite side of the prison. The inmates were determined to flee and told officers the only way to stop them would be to kill them. 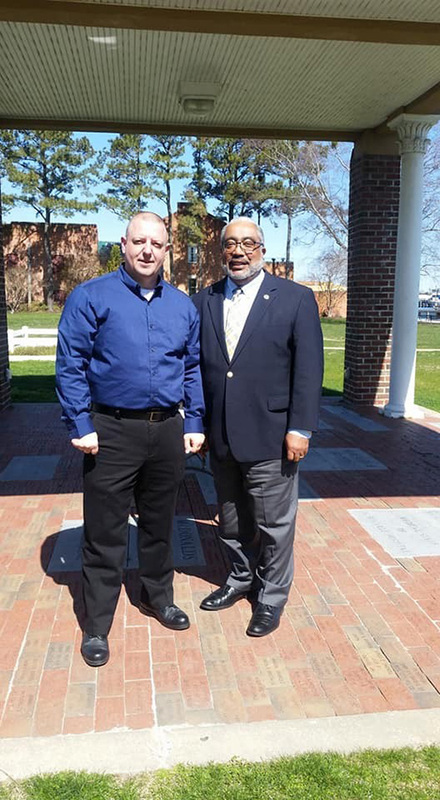 The N.C. Department of Public Safety announced last year that officers have to start basic correctional officer training when they begin their second week on the job. DPS's website also reports the backlog of officers without basic training wasn't eliminated until last week. Family member of Wendy Shannon accepts shadow box. Board member Carla Elkins and Shadowbox creator Eric Brainard. Ms. Parks and Ms. Pruden (HR staff from Pasquotank). Eric Brainard with Ron Wesson. Mr. Ron Wesson and Carla Elkins. Justin Smith's mom and brother accept shadowbox.